Fat Quarter Shop is a huge online fabric store that offers designer fabric in every style! It’s been a favorite of mine for about 6 years now. I’m a crafty girl that can sew…with limits. I’ve made simple quilts using pre-cut layer cakes, rag quilts, basic skirts and a ton of little projects. 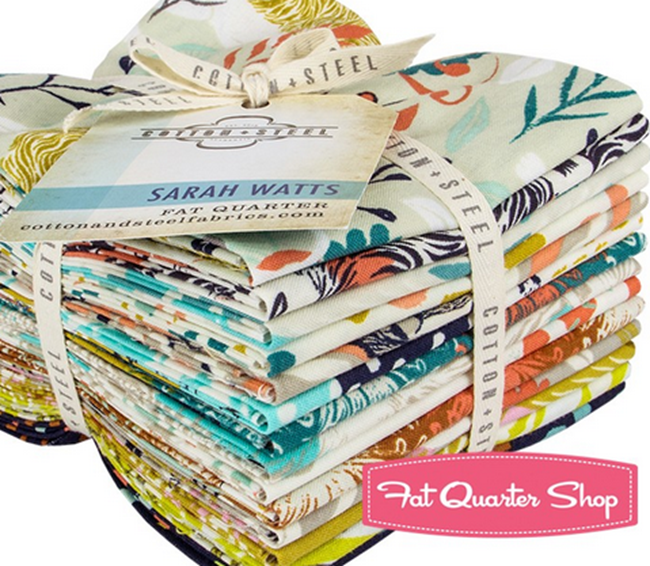 Fat Quarter Shop makes it easy to find and order the perfect fabric for your sewing projects. Everything ships super fast and arrives right on your doorstep…I love it! Cotton + Steel Fabrics…you will love all of these designs! Honeycomb by Chloe’s Closet…cute stuff! Cia Bella…oh my! I need this fabric! I have a red Vespa, so this is perfect for me! Butterfly Dance Collection…a Fat Quarter Shop exclusive! 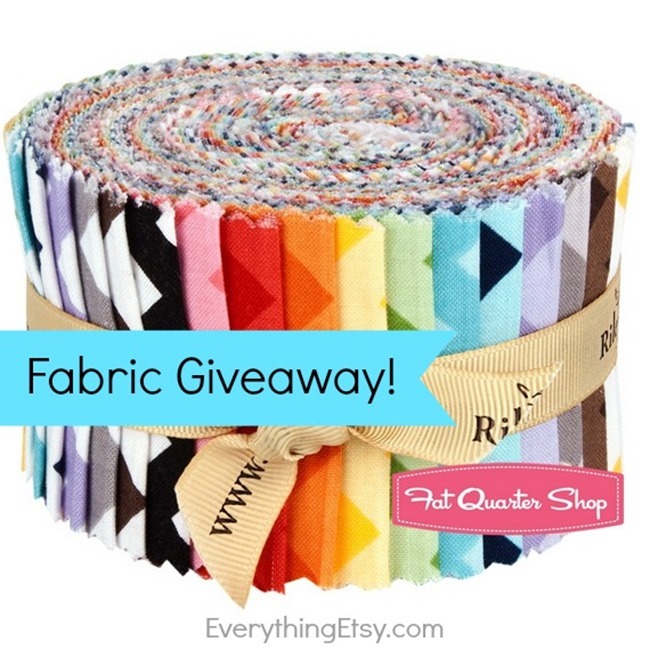 One lucky Everything Etsy reader will win a $75 gift certificate to Fat Quarter Shop! You’ll get to choose from quilt kits, charm packs, fat quarter bundles and yards of stunning fabric…fun, fun, fun! Visit Fat Quarter Shop and leave a comment about one of your favorite fabrics or fabric collections. You’re sure to get lost in fabric world awesomeness for a few minutes, but that’s not a bad thing, right?! Enter the giveaway with the widget below…good luck! I love all things Moda and they have the best selection! I would love the cotton + steel line. Color Me happy and Cotton and steel basics! My favorite FQS collection at the moment is Cotton + Steel. These fabrics are so gorgeous! Love! Fabric is my weakness – I have so many projects waiting to happen. The honeycombs are my current favorite, the colors, the prints, the patterns…best ever. I love the Chantilly By Lauren & Jessi Jung For Moda Fabrics range. It’s so pretty and girly! After reviewing tons of different collections, I LOOOOVED the Brambleberry Ridge collection. I love all of the fabrics and want unlimited dollars to buy them all. i just adore the mini charm packs and the hexagons!!! I love the Anne Kelle fabrics. Urban Zoology is great for making my granddaughters skirts. I love the Gleeful line as well as Miss Kate! Thanks for this great giveaway! I love the cotton + steel fabrics. I love the Birch Farm collection! Cotton + Steel for the win. Love, love, love this whole line! LOVE the Rain Essentials bundle from Pat Bravo for Art Gallery Fabrics. right now i’m digging all of the cotton+steel fabrics! I love them all! How do you choose! Currently crushing on Cotton &Steel! Having a 2 year old daughter, I’m loving their Disney princess fabrics! Butterfly Dance is my favorite collection because of those adorable little pixies. They’re begging to be made into a fabulous baby quilt, a dress for my niece, and a couple of pillows for my sewing room. What a choice, as usual ! So pretty, so many ! Ok, If I had to pick one, I’d choose a one yard bundle, so that fabrics make a theme for me. I’m used to pick one by one fabrics, never by collection… So, as a first try, I’d choose… Happy Harvest Brown One Yard Pack. But the whole collection is sooo nice ! Thanks for this giveaway, and nice week to everyone ! I really do like the Cotton and Steel but I could use some Batiks like Dovetail or Hoffman to finish a project I’m working on. A Bali Roll would be nice. 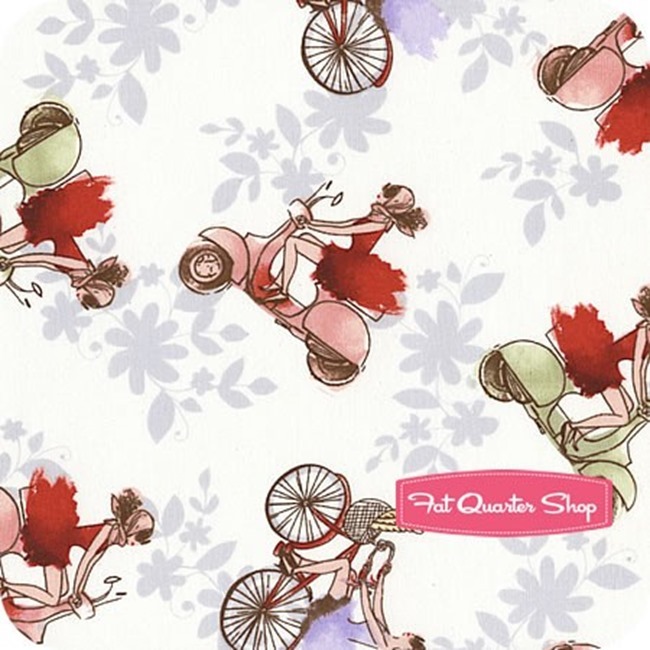 I think I’d purchase a fat quarter bundle of the Miss Kate fabric by Bonnie and Camille! New to the fabric/quilting world, and love it! Love anything cute and modern. I notice I’m drawn to moda fabric most of the time. I love the Horizon Shangri-La collection by Jason Yenter. Timeless Treasures Green Northern Lights and Ophelia scroll and dot patterns. Mustang by Melody Miller for Cotton & Steel. I absolutely love the Art Gallery low volume fabric! Thanks for the chance to win! I love the seaworthy bundle! Butterfly Dance would be perfect to make a quit for my grand daughter! I love the Rain Essentials bundle. I love the selection of organic fabrics. My favorite is the Sea Salt Grass fabric! I am a fan of French General so I am liking their La Fete de Noel line. Thanks! My favorite line right now is Cotton + Steel. Betty Dear Screamin’ Yellow Pen Strokes Yardage ! I just really like it for backing! Love that it would go with anything! Thanks for the giveaway chance! So far my favorites are the Black Cat Crossing by Maywood & the Starry Night collection by Lynette Anderson for RJR Fabrics. Any fabric in my hands is my favorite fabric! I hope I get picked!!! I love the princess range! One of my favorite lines of fabric is Moda. They have a very good line of fabrics. I like the pumpkin spice black large spaced floral print – so pretty, and perfect for the autumnal sachets I plan on making! I love the antoinette collection! I am so in Love with The Butterfly Dance Collection !!!!!!!! I’m really diggin’ the Riley Blake Small Chevron Fat Quarter Bundle! Seriously. I can already think of a million things I can use that bundle for. I love anything by Kate Spain. Thanks for the chance to win! I love the fabric collection “Honeycomb by Chloe’s Closet”…cute stuff! Good luck in the Giveaway y’all! Cotton and Steel August for me, thank you! I loved everything moda. I have a great gran coming so I am shopping baby fabric. I can’t wait to find out if I am sewing a pink or blue quilt. Love the new Cotton and Steel fabrics! I love the Bluebird Park collection! The Cat in the Hat Celebration Blue Cat in the Hat Faces!! I love Dr. Suess! I have a lithograph of cat in the hat! I love Moda and I love their selection of organic fabrics! Love the Cotton + Steel prints. I love the cotton and steel fabrics! I just found out I’m having a baby girl and would love to make her a cute quilt from some of these awesome prints! I too adore the Cia Bella! So cute! I have my eye on some Cotton + Steel basics. I love all of them, but cotton and steel is beautiful! Right now I really like Numbers by Zen Chic. I think I love them all! I did love the prints and colors of birch farm by joel dewberry! It’s hard to pick a favourite but I love the “Earth A Quilter’s Garden” fat quarter bundle. I really like Printemps. Thanks! Love the Star Trek collection, brings out the geek in me. Oh I love shopping for fat quarters, it makes me want to create! I really like Best Day Ever and Fancy. Of course, picking just two was very difficult. I love the CIA Bella collection!!! Thanks for the chance!! I love, love, love 1930`s quilts and enjoy using reproduction fabrics to make my own versions of these, so I’m eyeing the Dear Betty collection by Robert Kaufman. I love the Dr. Suess fabrics! Love fabric. love Fat quarter Shop. love Etsy. I am obsessed these. My local haberdashery stocks a great variety of the Fat Quarter fabrics. I use them to make lavender sachets. The combination of quality fabrics and Yorkshire lavender that I use is divine. Because I NEED more fabric! I want the Ciao Bella Fabric too! Cause I also have a Red Vespa. Do I really need to narrow it down to only ONE favorite…lol. In that case I would choose “Back Porch Prints” by Kaye England for Wilmington Prints. Thanks for the GREAT giveaway! I loooove Wee Wander by Sarah Jane! I am also always a sucker for 30’s style fabrics. Thanks for the chance to win! I love love the Artisan Spirit Shimmer! I love the Lexington Collection!!!!! I am a big fan of Art Gallery fabrics and was pleased to see the Arizona by April Rhodes collection. It’s my favorite of their current lines. Hi! I’m new to this site ~ compliments of a Kindred Spirit. 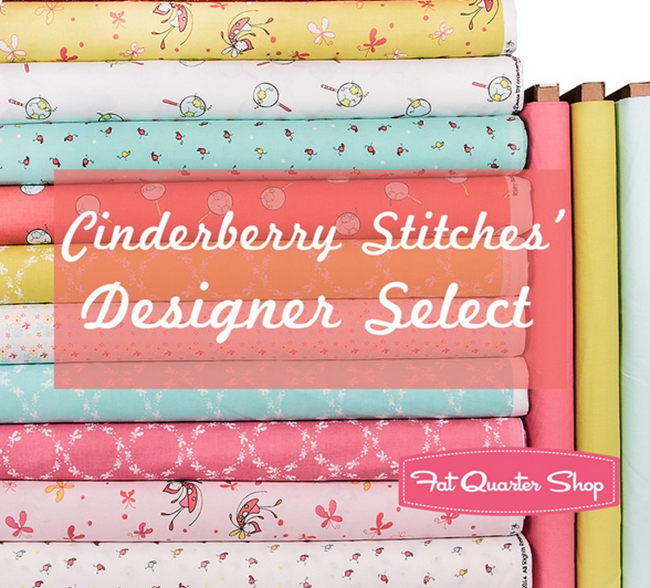 If I had to narrow down to one of the many beautiful fabrics at Fat Quarter I would go with the Cinderberry Stitches collection, simply because I have 8 grand daughters. And let’s face it ~ who doesn’t love pink for a girl? Thanks for the contest! ! I love pretty much anything in the Moda lines! I love Figures by Zen Chic! I always gravitate toward batiks and think Mosaic Batavian Batiks Purple and Teal Stylized Grass is my favorite in the shop. Fat Quarter Shop is my go to place for Moda fabrics. They carry so many of the lines that are hard to find or piece meal elsewhere. Miss Kate!! Can’t wait! Thanks! Only one!? Everything cotton + steel for me…. The Autumn Lily Petites caught my eye, but I would love any of these fabrics. Many thanks for the chance to win!!! Very hard to choose! 25th and Pine Peppermint Yuletide Blvd really caught my eye. Thanks! I love all of their fabrics. I especially want to try out some whimsical projects with the Butterfly Dance fabrics by Cinderberry Stitches. So Cute!! anything Art Gallery & Melody Miller’s Mustangs! Rosy Durham Quilt Revival Fat Quarter Bundle is the one I chose although I agonized and second guessed myself over my choice. So many beautiful fabrics to choose from! I love that Butterfly Dance collection! Cotton and Steel. Thanks for the generous giveaway. I love the 30’s Playtime Collection! I really like some Butterfly Dances but also have my eye on Stonehenge. Stonehenge makes for some great “basics”. Thanks for the chance to win! I love the Everyday Party Collection! The Hubba Hubba Collection is adorable! I love all things BasicGrey, and excited to see the new line, Persimmon, that comes out in September. Thanks for the give away! I love the Cotton + Steel basics, esp. with metallic accents. Loving Miss Kate by Bonnie and Camille. Their designs never fail to please! I had two favorites! I love the Aunt Grace Tie One On collection in brights, and also the Aunt Grace Miniatures collection. I discovered you can even search their sale fabric by theme – so helpful! I love the different batiks they carry. I love their Black Cat Crossing bundles! I’ve had my eye on those. French General. I _love_ French General. Too many beautiful fabric lines to pick just one favorite! Today I’m loving In The Ocean by Lesley Grainger for Riley Blake Designs. I like the Black Tie Boogie Red on White Damask Yardage from Red Rooster. I love fabric and fat quarters work like a charm for me and my baby blankets 😀 My favorite fabrics are in coraly tones, right now. I love the Butterfly Dance Fat Quarter Bundle Cinderberry Stitches for Riley Blake Designs. I am collecting repro 1930s prints! I love fat quarters selection! I love the colors and patterns in Butterfly Dance, and I really appreciate the convenience of being able to work with so many beautiful precuts. I love the With All My Heart collection. i love all of these fabrics. thank you so much for such a fun giveaway! I’ve been wanting to make a quilt with hexagons, but am daunted by the task of cutting them! Fat Quarter Shop has some great precuts- I’d love to get them! I love the Bartholo-Meows Reef fat quarter bundle. I am in awe of the new Dr. Seuss line of fabrics. I can just picture the great kids’ charity quilts these fabrics would make! I just adore the fort firefly range from birch, who can resist such gorgeous colours? I would love to get the Rain-A Quilter’s Garden FQ bundle. I love the Gleeful fabric collection! Oh! I NEED that Butterfly dance collection! So excited for Cotton Steel fabrics! I also love Arizona and Winged by AGF! I am loving Mustang by Melody Miller for Cotton and Steel. Love the gold accents! Brambleberry Ridge is a current favorite. Of course my favourite at the moment is Cotton + Steel! I love the Cinderberry fabrics. Oh my….I have so many favorites! I am a big fan of Sweetwater, Kansas Troubles, Jan Patek, Bonnie & Camille, and Denyse Schmidt. Thank you! My favorites are ever-changing, but right now it is Denyse Schmidt’s Hadley line. I just bought some cotton + steel fabric this weekend. I’ve been coveting the Moda 25th & Pine charm packs. I have to start now if I’m going to get something done by Christmas! I love the Everyday Party Organic Multi Bear Family Yardage – but there are so many cute ones!! Up Parasol Collection” is my favorite fat quarter bundle. The colors are so pretty and go so well together. So hard to pick – but some Cotton + steel basics would be a great addition to me stash. Thanks for the competition! So many favourites, but I love Daydream by Kate Spain! I like Hubba Bubba from Moda. So hard to say! I’m a big fan of the 1930s fabrics, so I’ll have to go with the Lazy Daisy Baskets by Darlene Zimmerman. Thank you for the giveaway! I’d be buying some Cotton and Steel – especially the basics collection! I’m on the lookout for cute pirate prints for the next nursery! I’ve had the Rainbow Tonga Treat Mini charm pack on my personal wish list for a while now. I would love to make a lap quilt for my son with them. I have been swooning over Gleeful lately. I love the Dear Stella Wild collection. It’s so fun for baby quilts. Thanks for the awesome chance to win! I love cotton and steel. Thanks for a chance at a great prize!! So many wonderful fabrics to choose from, one of my favourite collections is homestead gatherings. I’m riding the Cotton & Steel bandwagon right now, loving Mustang and Moonlit. Thanks for the chance to win! Alyssa Lichner’s Blogger’s Choice was one of the ones I liked. To be honest though – there are sooo many beautiful and different fabrics that choosing just one was quite challenging! Ooh, I really love them all, but if I have to pick just one, I’ll say the Peacock Artisan Spirit Fat Quarter Bundle. I just adore those colors. right now, it’s MIss Kate! Right of the bat, the Lexington line I saw on the very first page is GORGEOUS. Love that site! I’m always in need of solids and FQS has just what I always need. Love the Moda precuts -they have pretty much the widest selection of any shop I have seen. The Lexington line is beautiful. I like he Winged by Bonnie Christine for Art Gallery Fabrics selections. I love, love the Wishes by Sweetwater fat eighth bundle! I am also drawn to the Chameleon quilt kit! Anything in the Cotton + Steel collection. They are so pretty. Does saying I love fabric count? Cloud 9, Art Gallery and Zen Chic are at the top of my mind now. I love moda and anything precut! I like the In The Ocean Fat Quarter Bundle Lesley Grainger for Riley Blake Designs! I’m mad about Cotton + Steel, and I love Arizona and Gleeful, Winged by Bonnie Christine has also caught my eye! If I was pushed for a favourite I think I’d have to pick the Arizona collection by April Rhodes – I love the colours and the shapes used! I might need some Sweet as Honey.